Let you enjoy the unique hills of Langhe county, where history and enogastronomic tradition meet to make yourself live daydream. You'll find the B&B "Alba in Langhe" in Verduno, called "La sentinella delle Langhe" (The Langhe Sentinel) because here is where this territory begins. The B&B is a result of a detailed and careful renovation of the mansard floor, in a house with garden and private court-yard. We are Anna and Annibale and we'll be pleased to pamper their guests serving rich breakfasts and tiding up the rooms daily. Breakfast will be served in a wide and bright kitchen with lovely view over the Alpi mountains, and Langhe and Roero hills. We will help you start your day in the best way, delighted with all the delicatessen chosen for you day by day. We will offer you a rich sweet and tasty buffet with homemade cakes, jams, yogurt and cereals, eggs, salted meat and cheese, fruit juices and fresh fruit, milk, tea and coffee. A large living room will make yourself welcome, where a 180° view on Langhe landscape will take your breath away. The gorgeous view is the background to a comfortable sitting room with two sofas, a TV area and a reading corner. Is also available a free Wi-Fi connection. The B&B owns two rooms, both with private bathroom and walk-in closet. Rooms are wide, bright, soberly furnished with modern furniture and they have been thought to offer peacefulness and great comfort to our guests. Fully air conditioned. The room is provided with a double bed, or twin beds, with two night tables, chest of drawers, one desk, two chairs and a walk-in closet. The private bathroom is wide with bathtub and shower. The room is equipped with a double bed, or twin beds, with two night tables and chest of drawers, one desk, two chairs and a walk-in closet. This room has got its own balcony where you can enjoy moments of relax. The private bathroom is wide, with shower. WE RECOMMEND YOU TO BOOK DIRECTLY THROUGH OUR ACCOMMODATION BY PHONE OR WRITING AN E-MAIL. 20,00 € per night for additional baby cot. Smoking is not allowed in the house; pets are not allowed. The address is Via Castagni 9, Verduno. 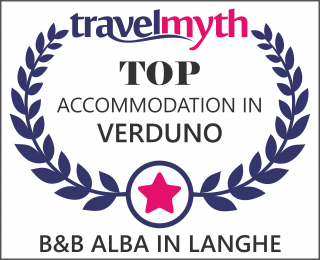 Verduno village, in the middle of Barolo area and native land of "Verduno Pelaverga", is situated 3 Km away from La Morra, and 10 Km away from Alba. You can easily reach it by the provincial road passing near Roddi, or coming from Barolo, Vergne, La Morra. The little village deserves a visit for its historic center kept intact, shaped in its original ring, for its "belvedere," one of the most beautiful of the Langhe area that offers a gorgeous view on vineyards, for its castle, an eighteenth century Juvarra palace, and for the San Michele Arcangelo church in "tardo barocco" style that keeps inside the icon of "Beato Sebastiano Valfrè". Verduno is one hour away from Torino Caselle airport, by car, and two hours away from Milano Malpensa airport.